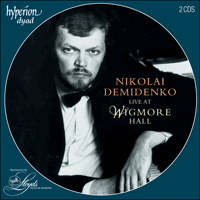 The performances on this two-CD set were recorded during Piano Masterworks, a series of six concerts given by Nikolai Demidenko in Wigmore Hall, London, between January and June 1993. Devised by Ates Orga, under the patronage of The Lord Birkett, sponsored by Lloyds Private Banking, these recitals ranged across 250 years of keyboard music, instrumental technique and the development of modern piano resource – from Scarlatti to Gubaidulina. As a concept the series was modelled on nineteenth-century Romantic practice. In Paris, between 1873 and 1877, Charles-Valentin Alkan gave regular ‘Petits Concerts de Musique Classique’ – six recitals each, surveying the repertoire from Couperin, Bach, Handel and Scarlatti to Weber, Chopin, Schumann and Mendelssohn. Later, the Russian Anton Rubinstein created a cycle of seven Historical Recitals with which he took his farewell of Europe in the mid-1880s. At over three hours individually, these embraced a repertoire from Byrd and John Bull to Balakirev and Tchaikovsky. Like Franz Liszt, Ferruccio Busoni, too, was historically aware, his programming ranging from Bach to Liapunov. The Bohemian Jan Václav Vorísek, an exact contemporary of Czerny, studied with his father (like Schubert’s, a schoolmaster) and then with Tomásek, who thought he had such ‘grosses Talent’ that he taught him for nothing. In 1813 he settled in Vienna, ‘the undisputed musical capital of the world’ (Spohr). Here he had lessons from Hummel and Moscheles. He became associated with Beethoven’s circle. He befriended Meyerbeer and Schubert. He conducted concerts of the Gesellschaft der Musikfreunde (including Beethoven’s Second Symphony in 1819). And, supported by Salieri, he became first organist of the Imperial Chapel (in 1824). Gently dynamic, a rural melodist sympathetic to Baroque and Classical thought, alert (like Weber) to the expanding Romantic possibilities of the piano, Vorísek’s output was small but serious: a Symphony in D (recorded on Hyperion CDA66800); some concerted variations; a Grand rondeau concertante for piano trio and orchestra (cf. the Beethoven Triple Concerto); a Violin Sonata dedicated to Beethoven’s patron, the Archduke Rudolph; and a ‘Sonata quasi una fantasia’ for piano in B flat minor (retrospectively Beethovenian, prophetically Chopinesque), whose cyclic construction places it on a level with the contemporaneous ‘Wanderer’ Fantasy of Schubert. A quantity of church music, austere and Catholic. And eighteen Rhapsodies and Impromptus for piano dating from between 1812/13 and 1822 – explorations in early Romanticism providing a transitional bridge between Tomásek and his compatriots and the folklorism to come of Smetana and Dvorák. An essay of concentrated power and emotional depth culminating in a chapter of high psycho-drama, the music, after the model of Emanuel Bach, is cast in the form of a double-variation structure – that is to say, two binary themes (the first a funereal Andante in the minor, the second a reflective consolation in the tonic major) are used alternately as a basis for extended elaboration and development. Harmonically, the Neapolitan G flat chord in the second half of the first theme, prophetic of things to come in middle-period Beethoven (not least the Appassionata and the Op 95 Quartet), is a landmark of especially telling intensity. It is by his extraordinary single-movement keyboard sonatas, or Essercizi – over 550 of them – that Domenico Scarlatti, a contemporary of Bach and Handel, is best remembered today. ‘Elegant, lively, clever, brilliant in their virtuosity … rococo music of the finest type’ (Hugo Leichtentritt), a treasury of miraculous fantasy and invention, they are revolutionary and revolutionizing expressions of genius. Designed, the composer tells us, not to display ‘any profound learning, but rather an ingenious Jesting with Art’, the vitality of their imagination, the pungent audacity of their harmonic language, the tension of their displaced accents and cross-rhythms, the style and texture of their keyboard manner (with colouristic effects and extravagant three-dimensional leaps and changes of position that transform our whole conception of classical bass and treble registration), the flamboyance of their dynamic and kinetic energy is remarkable. They sound youthful. They aren’t. As Ralph Kirkpatrick comments in his famous study of the composer published forty years ago: ‘Unlike Purcell, Mozart, or Schubert, Domenico Scarlatti was not born with the gift of prophecy. Like Rameau, Haydn, or Verdi, he discovered his richest channels of inspiration in his old age … what looks like the development of a lifetime actually took place after Scarlatti was fifty, and largely after his sixty-seventh year!’ The Sonata in C minor, Kk11, comes from the printed Essercizi of 1738/9; the B minor, Kk377, from a manuscript collection in a copyist’s hand, prepared for the Queen of Spain in 1754 (Biblioteca Nazionale Marciana, Venice). Completed on 29 January 1833, with a dedication to Moscheles, Felix Mendelssohn’s Fantasy in F sharp minor, Op 28, was originally called ‘Sonate ecossaise’. Accordingly, William S Newman (1969) suggests, ‘it belongs with the numerous nineteenth-century sonatas of Beethoven, Schubert, Schumann, Liszt, and others, that raise the question of sonata or fantasy. In this instance the fantasy predominates over the sonata in the sense that free passagework predominates over phrase-and-period syntax, or that leading ideas tend to lose themselves in the passagework’. The opening movement is in five sections, made up of Agitato and Andante material in alternation, with each tonic key presentation of the main Andante idea texturally or dynamically varied. The final unharmonized appearance of this measured theme, coalescing out of tierce de Picardie shadow, is striking. An A major Schubertian Scherzo in 2, with a quaver-motion ‘trio’ in the subdominant, D, comprises the second movement. Its good humour unprepares us for the dramatic contrast of the finale, a study in sonata form calling for consummate pianism to do justice to the storms and stresses of its tidal race. All three movements are linked cyclically by the same descending triadic figure – which, however, Mendelssohn artfully disguises through harmonic change or decorative elaboration. If Paganini is perfection, Kalkbrenner is his equal, but in quite another style. It is hard to describe to you his calm, his enchanting touch, his incomparable evenness, and the mastery that is displayed in every note; he is a giant, walking over Herz and Czerny and all – and over me … You must know that Kalkbrenner’s person is as much hated here as his talent is respected by all and sundry; he does not make friends with every fool, and … he is superior to everything that I have heard. Historically, Ludwig van Beethoven’s An die ferne Geliebte (‘To the distant beloved’, Op 98, 1815/16) was the first example of a unified, musically continuous, Lieder cycle. ‘A favourite source-book’ of Schumann’s, memorably alluded to in his Op 17 Fantasy, it was widely admired by early critics: ‘Among the most beautiful of all [songs] we possess … when he so desires … [Beethoven] can write vocal music as well as anyone else’ (Allgemeine Musikalische Zeitung, Leipzig 1817). Combining facets of sonata design, variation and strophic form, its six songs are arranged ‘in a purposeful order of keys and [feature] a recapitulation followed by a miniature ‘symphonic’ coda’ (Joseph Kerman, 1980). Texted and essentially faithful to the original, the Liszt transcription dates from 1849, the year of Chopin’s death. Alban Berg’s Sonata in B minor (Vienna, 1907/08) belongs to his student years under Schoenberg. A dark work of penetrating tragedy, of impassioned post-Tristanesque shadow, of late Romantic Mahlerian imagery, the tonal ambiguity of its augmented triads and tritone … the suspension and dissolution of its harmony … the complexity of its rhythm … the concentrated nature of its motivic growth … the resignation, the climactic swell, the tensile drama of its spiritual cry … the way it glimpses the thinker to come, the visionary creator of Wozzeck and Lulu … mark it among the most remarkable early documents of the twentieth century. In speaking of its ‘subjectively ‘emotional’ sound world’ and its ‘singular economy of means’, its wholehearted romanticism yet its ‘astonishing restraint’, Susan Bradshaw (1972) identifies its essential paradox. It is an extraordinarily powerful statement – spiritually naked, formally contained – its continuously evolving and developing event unfolding within nine pages of the most intricate contrapuntal voicing, intimate, chamber-like delicacy and massively structured pianistic climax. The overall ground plan alludes, seamlessly, to a single-movement sonata design with (repeated) exposition, elaboration (Leibowitz’s term) and recapitulation, plus interpolated fragments suggestive of Scherzo and Adagio. Important germinally to everything that follows, the opening is sculpted out of a piano/accel/rit gesture comprised of three basic cells: ascending perfect and augmented fourths (borrowed from Schoenberg’s First Chamber Symphony of 1906, and used both thematically and harmonically); descending major thirds (spelling out an augmented chord); and a falling semitone suspension. Published at the composer’s own expense in Berlin in 1910 (without, on Schoenberg’s advice, the addition of two planned extra movements), the first performance was given at a concert organized by the Viennese Society for Art and Culture on 24 April 1910. A critic reported the occasion: ‘Mr Berg has written a piano piece (boldly entitled ‘Piano Sonata’) which shows traces [sic] of talent and musicality’. Universally considered to be one of the most significant creative forces of the post-Prokofiev/Shostakovich generation currently working in Russia, the Tartar composer Sofia Gubaidulina studied piano and composition in Kazan. Subsequently, between 1954 and 1963, she attended the Moscow Conservatoire where her teachers included Shebalin and Peiko. A rebellious student drawn to the unorthodox, she enjoyed in her youth both the approbation and disapproval of Shostakovich: ‘I want you to continue along your mistaken path’, he is once said to have advised her. Of strong religious faith and mystical persuasion, a disciple of the philosopher Nikolai Berdyaev, Gubaidulina lives in Moscow where she divides her time between composing, writing scores for documentaries, films and cartoons, and experimenting with unusual sounds and materials. (Since 1968 she has been associated with the Electronic Music Studio, Moscow, and in 1975 formed a group, Astreya, specialising in improvisation using folk instruments from the Trans-Caucasian and Central Asian republics.) Denounced by the Soviet Composers’ Union in 1980 for cultivating an avant garde style preoccupied with ‘the resolution of problems of secondary importance … outside real life’, Gubaidulina won the Seventh International Composers’ Competition in 1975 and received the Prince Rainier of Monaco Foundation Composition Prize a decade later. Bach, Webern and Shostakovich, she says, have been the principal influences on her musical development. All three, to a greater or lesser extent, underwrite the Ciacona for piano of 1962. This is an extraordinary tour de force. On the one hand it is chroma-diatonically tonal: it begins and ends in B minor. On the other it is freely serial: its ground bass, spelt out in octaves at the end and proclaimed horizontally and vertically at the beginning, adds up to a 23-note tone row, using (and variously repeating) all twelve pitches of the chromatic scale and fashioned out of adjacent and dovetailed minor and major thirds rounded off by segments of two whole-tone ascents. This tone row is subjected to processes of inversion, retrograde motion and retrograde inversion. By transposing it to different degrees of the scale, an illusion of changing ‘key’ centres and ‘modulation’ is created. In the spirit of Bach, no less than Brahms (the finale of the Fourth Symphony), Gubaidulina’s Ciacona is in essence both chaconne (a recurrent harmonic sequence) and passacaglia (a recurrent ground bass). Structurally, as a variation cycle, it is rotational. But at the same time, alla the great masters, its outline is informed by subtle departures of the most inventive flexibility. It may open, for instance, pseudo-baroque-like, with a grand statement, Andante maestoso, eight bars long. But in the interests of musico-dramatic need few of its 23 subsequent sections (as many sections as notes of the tone row) – each audibly distinguished by changes of texture, tempo, rhythmic pattern, dynamic level, and keyboard figuration – are confined to this length. Most expand or contract instead. Aurally and visually, the music – framed, spectrally, by a disembodied Busoni aura – evokes images of Bach and Brahms, or introspective late Beethoven, no less than memories of uncompromising Mussorgsky (the final tableau of Pictures at an Exhibition), of angular Prokofiev. In its journey, old devices come across with revitalized energy: the bizarre più mosso two-part fugal imitation and stretto by inversion of the fourteenth section, for example; the inverted ‘dominant’ pedal points of the twentieth and twenty-first sections, getting faster and faster by progressively shortening note values; the massively monumental return – re-harmonised, blackly pathétique – of the ciacona ‘ground’ in the penultimate ‘chapter’. From blocks of sound to breaths of whispered murmur, from granite-hewn immediacy to cosmically nebulous distance, from thunderous octaves to spare linearity, from densest texture to brightest metallic glitter, is the breadth of its pianistic horizon. The seventh of the ten pieces that make up Franz Liszt’s Harmonies poétiques et religieuses, Funérailles essays the monumental and the tragic. An extraordinary, lingering in memoriam of epic vision and elegiac song, torn by anguish and tears, its pages commemorate not the death of Chopin (a once-popular view based on the association of the rotating left-hand octaves of its fourth section with those of the trio in Chopin’s Polonaise in A Flat, Op 53) but rather the doomed Hungarian uprising of October 1849. In its unfolding we find ‘not simply the expression of a personal sorrow’, Alan Walker believes (1989), ‘but a symbol of that universal suffering felt by mankind when great ideals perish and the heroes who espoused them (of whatever nationality) are no more’. Published over a thirty-year gap between 1827 (Nos 1 and 2) and 1857 (Nos 3 [transposed up a semitone] and 4), Franz Schubert’s Impromptus D899 (his first set) were completed in Vienna during the second half of 1827. In the autograph MS (now in New York) neither title, nor Schubert’s name, are in his own hand. Like their companions D935 and D946, they are statements related in freedom of Romantic lyrical spirit to the 42 Eclogues, 15 Rhapsodies, 3 Dithyrambs and 6 Allegri of Tomásek (music spanning a period from 1807 to 1823); and, in broad structure, to the Impromptus Op 7 of Vorísek (printed in Vienna in 1822) – coincidentally both Bohemian composers from Prague. No less, they are innovative, inquiring creations informed, as Alfred Einstein reminds us, by an originality at once unmistakably Schubertian, by dimensions of organic growth and colour wonderfully unified and varied. No 4, the most outwardly Vorísekian in its ternary shape, contrasts étude brilliance with a tenor melody of singing ‘cello’ eloquence and a throbbingly elegiac middle Trio section in C sharp minor. The cast of its first page, rich in cascading broken chords and repeated notes in six-bar (4+2) phrases, is striking for establishing the tonic home key (bar 31) only after beginning in the minor, followed by two side-stepping diversions in the direction of B (= C flat) major and minor respectively. Les oeuvres figurant sur ce coffret de 2 Disques Compacts furent enregistrées lors des Piano Masterworks, une série de six concerts donnés par Nikolai Demidenko au Wigmore Hall (Londres) entre janvier et juin 1993. Organisés à l’initiative d’Ates Orga, patronnés par The Lord Birkett et commandités par Lloyds Private Banking, ces récitals couvrent 250 ans de musique de clavier, retraçant l’évolution de la technique instrumentale et le développement des ressources du piano moderne, de Scarlatti à Gubaidulina. L’objectif des Piano Masterworks était de présenter, à travers une sélection subjective, une vue d’ensemble historique offrant un aperçu de l’évolution du style, des valeurs esthétiques et des solutions originales marquantes. La série fut lancée en Irlande du Nord durant la saison 1991/92; elle commença au festival de Belfast et continua sous les auspices de Queen’s University (Belfast) et du Arts Council of Northern Ireland. Le compositeur bohémien Jan Václav Vorísek, un contemporain exact de Czerny, étudia avec son père (instituteur, comme le père de Schubert) puis avec Tomásek, qui décela en lui un tel ‘grosses Talent’ qu’il lui prodigua son enseignement gratuitement. En 1813, Vorísek s’installa à Viennen ‘la capitale musicale incontestée du monde’ (Spohr). Là il prit des cours avec Hummel et Moscheles. Il devint associé au cercle de Beethoven, se lia d’amitié avec Meyerbeer et Schubert, dirigea des concerts de la Gesellshaft der Musikfreunde (notamment la deuxième symphonie de Beethoven en 1819), et, soutenu par Salieri, devint le premier organiste de la Chapelle impériale (en 1824). Nature doucement dynamique, mélodiste rural attaché à la pensée baroque et classique, mais conscient (comme Weber) du développement des possibilités romantiques du piano, Vorísek produisit une oeuvre peu abondante mais sérieuse. Une symphonie en ré (toujours dans le répertoire); plusieurs variations pour orchestre; un Grand rondeau concertante pour trio de piano et orchestre (voir le triple concerto de Beethoven); une sonate pour violon dédiée au protecteur de Beethoven, l’archiduc Rudolphe; et une ‘Sonata quasi una fantasia’ pour piano en si bémol mineur (rétrospectivement Beethovénienne, mais annonçant Chopin), dont la construction cyclique la place aux côtés de la fantaisie ‘Wanderer’ de Schubert. Enfin, une quantité importante de musique d’église, austère et catholique, et dix-huit Rhapsodies et Impromptus pour piano écrits entre 1812/13 et 1822 – des explorations du début du romantisme faisant le lien entre la musique de Tomásek et ses compatriotes et le folklorisme de Smetana et Dvorák à venir. Il s’agit d’une essai d’une puissance d’une profondeur émotionnelle intenses, culminant dans un chapitre hautement psychodramatique; l’oeuvre reprend la forme de la variation double introduite par Emanuel Bach: deux thèmes binaires (le premier un andante funèbre en mode mineur, le second une consolation méditative dans la majeure homonyme) sont utilisés alternativement comme matériau de base pour l’élaboration et le développement. Sur le plan harmonique, la sixte napolitaine de l’accord de sol bémol dans la deuxième moitié du premier thème, annonçant un procédé que Beethoven allait exploiter vers le milieu de sa carrière (notamment dans l’Appassionata et dans la Quatuor, Op 95), est un point de repère d’une intensité particulièrement révélatrice. Achevée le 29 janvier 1833, avec une dédicace à Moscheles, la Fantaisie Op 28 de Felix Mendelssohn portait pour titre original ‘Sonate écossaise’. William S Newman (1969) commenta à ce sujet qu’elle faisait partie des ‘nombreuses sonates du XIXe, de Beethoven, Schubert, Schumann, Liszt ou autres, dont il est difficile de décider s’il sagit d’une sonate ou d’une fantaisie. Dans ce cas précis, la fantaisie l’emporte sur la sonate en ce sens que les traits libres l’emportent sur la syntaxe de phrase complète, ou encore que les idées principales ont tendance à se perdre dans ces traits’. Le premier mouvement comprend cinq sections où alternent des passages agitato et andante, l’idée andante principale étant soumise à une nouvelle variation texturale ou dynamique chaque fois qu’elle est présentée dans le ton de la tonique. Le dernière apparition, dénuée d’harmonisation, de ce thème mesuré, est particulièrement saisissante. Le second mouvement est un scherzo schubertien à deux temps, en la majeur, avec un ‘trio’ dominé par ses traits de croches dans le ton de la sous-dominante, ré. On passe brusquement de la gaieté de ce mouvement à l’atmosphère dramatique du finale, une étude en forme sonate qui nécessite une technique pianistique achevée pour mettre en valeur toute la tourmente et la tension de sa course déferlante. Les trois mouvements sont liés de façon cyclique par le même motif de trois notes descendantes – que Mendelssohn prend cependant le soin de déguiser habilement à travers des changements harmoniques ou des élaborations ornementales. Si Paganini est la perfection, Freidrich Kalkbrenner est son égal, mais dans un tout autre style. Il est difficile de vous décrire son calme, son toucher enchanteur, son incomparable régularité, et la maîtrise qui est déployée dans chaque note; c’est un géant. marchant au dessus de Herz, de Czerny et des autres – et au dessus de moi … Vous devez savoir que la personne de Kalkbrenner est ici aussi détestée que son talent est respecté par tous sans exception; il ne se lie pas d’amitié avec n’importe qui, et … il est supérieur à tout ce que j’ai entendu. Historiquement, An die ferne Geliebte (‘A la bien-aimée lointaine’, Op 98, 1815/16) de Ludwig Van Beethoven fut le premier exemple de cycle de Lieder unifié et musicalement continu. Un des ‘ouvrages de base préférés’ de Schumann, auquel il fait mémorablement allusion dans sa Fantaisie Op 17, il était également très largement admiré par les critiques de l’époque: ‘Parmi les plus belles de toutes [les chansons] que nous possédons … quand il le désire … [Beethoven] peut écrire de la musique vocale aussi bien que tout autre compositeur’ (Allgemeine Musikalische Zeitung, Leipzig 1817). Combinant certains aspects de la structure de la sonate, de la variation et de la forme strophique, ses six Lieder se succèdent ‘dans un ordre de tonalités intentionnel et [contiennent] une réexposition suivie d’une coda ‘symphonique’ miniature’ (Joseph Kerman, 1980). Complétées de textes et essentiellement fidèles à l’original, la transcription de Liszt date de 1849, année de la mort de Chopin. La Sonate en si mineur de Alban Berg (Vienne, 1907/08) date des années où il était l’étudiant de Schoenberg. Oeuvre sombre d’une tragédie pénétrante, où l’ombre passionnée de l’après-Tristan se mêle aux images mahlériennes de la fin du romantisme, tout dans cette pièce concourt à en faire l’un des documents les plus remarquables du début du XXe siècle – entre autres, l’ambiguïté tonale de ses tritons et de ses accords de quinte augmentée, ses retards et ses dissolutions harmoniques, la complexité de son rythme, la nature concentrée de son développement motivique, la résignation, le gonflement sonore au point culminant, le drame élastique de son cri spirituel, ou encore la façon dont elle laisse entrevoir le penseur futur, le créateur visionnaire de Wozzeck et de Lulu. En évoquant son ‘univers sonore subjectivement ‘émotionnel’ et sa ‘singulière économie de moyens’, son romantisme chaleureux et en même temps son ‘étonnante retenue’, Susan Bradshaw (1972) identifie le paradoxe essentiel de l’oeuvre. Il s’agit d’une assertion extraordinairement puissante – à la fois nue sur le plan spirituel et contenue sur le plan formel – dont l’événement, qui évolue et se développe sans cesse, se révèle en neuf pages d’une partition combinant un agencement contrapunctique des voix des plus complexes, une délicatesse intime, semblable à celle de la musique de chambre, et un point culminant pianistique à l’architecture massive. Le plan horizontal global fait allusion, sans coupure, à une structure de mouvement sonate avec une exposition (répétée), une élaboration (le terme employé par Leibowitz) et une réexposition, où viennent s’intercaler des fragments évoquant un scherzo et un adagio. Constituant le germe de tout ce qui suit, le début est sculpté à partir d’un geste piano/accel/rit comprenant trois cellules fondamentales: (a) des quartes justes et augmentées ascendantes (empruntées à la Première Symphonie de chambre de Schoenberg, 1906, et utilisées au niveau thématique comme au niveau harmonique); (b) des tièrces majeures descendantes (formant un accord de quinte augmentée); et (c) un retard de demi-ton descendant. Universellement reconnue comme l’une des principales forces créatrices de la génération post-Prokofiev/Chostakovitch travaillant aujourd’hui en Russie, la compositrice tatare Sofia Gubaidulina commença à étudier le piano et la composition à Kazan avant d’entrer au conservatoire de Moscou où elle étudia, de 1954 à 1963, avec des professeurs tels que Shebaline et Peiko. Etudiante rebelle encline à l’anticonformisme, elle fit l’objet à la fois de l’approbation et de la désapprobation de Chostakovitch, qui lui conseilla un jour: ‘Je veux que vous continuiez dans votre mauvaise voie.’ Possédant une solide foi religieuse et d’obédience mystique, disciple du philosophe Nikolai Berdyaev, Gubaidulina vit à Moscou où elle partage son temps entre la composition, l’écriture de musique pour des documentaires, des films et des dessins animés, et la recherche expérimentale avec des sons et des matériaux insolites. (Elle est associée depuis 1968 avec le studio de musique électronique de Moscou, et a fondé en 1975 le groupe Astreya, spécialisé dans l’improvisation utilisant des instruments folkloriques de la Transcaucasie et de la république d’Asie Centrale.) Accusée en 1980 par le syndicat des musiciens soviétiques de cultiver un style d’avant-garde s’occupant de résoudre des problèmes de seconde importance … en dehors des réalités de la vie’, Gubaidulina gagna le septième concours international des compositeurs en 1975 et se vit attribuer le prix de composition de la fondation du prince Rainier de Monaco dix ans plus tard. Bach, Webern et Chostakovitch, dit-elle, ont été les principales influences de son développement musical. Toutes les trois, à un degré plus ou moins important, se retrouvent dans la Ciacona pour piano de 1962. Il s’agit d’un extraordinaire tour de force. D’un côté la musique est chroma-diatoniquement tonale: elle commence et finit en si mineur. De l’autre, elle est librement sérielle: sa basse contrainte, énoncée octaviquement à la fin et déclarée horizontalement et verticalement au début, forme une série de 23 notes utilisant (et répétant diversement) les douzes hauteurs de la gamme chromatique, et ordonnées selon une séquence de tierces mineures et majeures adjacentes et raccordées entre elles, qui s’achèvent sur des segments de montée de deux tons. Cette série est soumise à des transformations inverses, rétrogrades et rétrogrades inverses. Une illusion de changement de centres ‘tonaux’ et de ‘modulation’ est créée par la transposition de la série sur différents degrés de la gamme. Dans l’esprit de Bach, non moins que Brahms (finale de la quatrième symphonie), la Ciacona de Gubaidulina est essentiellement une chaconne (une séquence harmonique récurrente) et une passacaille (une basse contrainte récurrente). Sa structure, comme un cycle de variations, est tournante. Mais en même temps, comme chez les grands maîtres, son contour est marqué par de subtiles digressions d’une souplesse extrêmement inventive. Elle commence, par exemple, dans un style pseudo-baroque, par une imposante déclaration andante maestoso de huit mesures. Mais dans l’intérêt des exigences musico-dramatiques, très peu de ses 23 sections (autant de sections que de notes dans la série) – chacune d’entre elles se distinguant clairement des autres à travers des changements de texture, de tempo, de schéma rythmique, de niveau dynamique et de figuration – se confinent à cette longueur. La plupart, au contraire, se dilatent ou se contractent. Septième des dix pièces qui constituent les Harmonies poétiques et religieuses de Franz Liszt, Funérailles est une incursion dans le tragique et le monumental. Vision épique et chant élégiaque déchiré par l’angoisse et le chagrin, cette oeuvre commémore non pas la mort de Chopin (une idée jadis répandue du fait de l’analogie des octaves tournantes de la main gauche dans la quatrième section avec celles du trio de la Polonaise en la bémol, Op 53, de Chopin), mais plutôt le soulèvement hongrois d’octobre 1849, tragiquement écrasé. Selon Alan Parker (1989), il ne faut pas simplement y voir ‘l’expression d’une douleur personnelle, mais un symbole de cette souffrance universelle que ressent l’humanité lorsque de grands idéaux périssent et que les héros qui les incarnaient (quelle que soit leur nationalité) ne sont plus’. Publiés avec trente ans d’écart entre 1827 (no1 et 2) et 1857 (no3 [transposé un demi-ton plus haut] et 4), les Impromptus de Franz Schubert (son premier cahier) furent achevés à Vienne durant la seconde moitié de l’année 1827. Dans l’autographe manuscrit (aujourd’hui à New York), ni le titre de l’oeuvre ni le nom de Schubert ne sont de sa main. Comme leurs pendants D935 et D946, ils s’apparentent, par la liberté de l’esprit lyrique romantique qui les anime, aux 42 Eclogues, 15 Rhapsodies, 3 Dithyrambes et 6 Allegri de Tomásek (une musique embrassant les années 1807 à 1822) – par coïncidence lui aussi un compositeur bohémien de Prague. Ce sont néanmoins des création investigatrices et novatrices, imprégnées, comme nous le rappelle Alfred Einstein, d’une originalité typiquement Schubertienne, de dimensions de développement organique et de couleur merveilleusement unifiées et variées. L’Impromptu no4, particulièrement proche des pièces de Vorísek quant à sa forme ternaire, met en contraste la brillance des études avec une mélodie ténor à l’éloquence de violoncelle, et un trio central d’une mélancolie lancinante en ut dièse mineur. Le schéma harmonique de sa première page, riche en cascades d’accords brisés et de notes répétées dans des phrases de six mesures (4+2), est particulièrement saisissant puisque le ton de la tonique n’est établi qu’à la mesure 31, après un premier passage en mineur suivi de deux diversions partant respectivement vers les tons de si (= ut bémol) majeur et mineur. Die Darbietungen auf diesen 2 CDs wurden während der Aufführungen von Meisterwerken fürs Klavier, einer Serie von sechs Konzerten, die Nikolai Demidenko zwischen Januar und Juni 1993 in der Wigmore Hall in London gab, aufgenommen. Diese von Ates Orga unter der Schirmherrschaft von The Lord Birkett geplanten und von Lloyds Private Banking finanziell unterstützten Konzerte erstreckten sich über 250 Jahre Musik für Tasteninstrumente, instrumentaler Technik und der Entwicklung moderner Klavierressourcen – von Scarlatti bis Gubaidulina. In einem selektiv subjektiven Rahmen sollten die Meisterwerke für Klavier einen historischen Überblick präsentieren, der ein Panorama sich ändernder Stile, ästhetischer Werte und phantasievoller Antworten bot. Die Serie wurde zum ersten Mal im Laufe von 1991/92 in Nordirland eingeführt. Sie begann beim Belfast Festival und wurde unter der Schirmherrschaft der Queen’s Universität in Belfast und dem Kulturausschuß von Nordirland fortgesetzt. Der aus Böhmen stammende Johann Václav Worzischek, ein genauer Zeitgenosse Czernys, studierte bei seinem Vater (der, wie Schuberts Vater, Schullehrer war) und dann mit Tomásek, der meinte, daß er ein derartig großes Talent besäße, das er ihn kostenlos unterrichtete. 1813 ließ er sich in Wien nieder, ‘der unbestritten musikalischen Hauptstadt der Welt’ (Spohr). Hier erhielt er Unterricht von Hummel und Moscheles. Er verkehrte in Beethovens Kreisen; er freundete sich mit Meyerbeer und Schubert an; er dirigierte Konzerte der Gesellschaft der Musikfreunde (einschließlich Beethovens Zweite Sinfonie im Jahre 1819) und, unterstützt von Salieri, wurde er erster Organist in der Kaiserlichen Kapelle (1824). Auf sanfte Art dynamisch, ein ländlicher Melodist mit Verständnis für den barocken und klassischen Gedanken, (wie Weber) den expandierenden romantischen Möglichkeiten des Klaviers gegenüber aufgeweckt, war Worzischek schöpferische Leistung zwar klein aber bedeutend. Eine Sinfonie in D-Dur (immer noch im Repertoire); einige Konzert-variationen; ein Grand rondeau concertante für Klaviertrio und Orchester (cf. Beethovens Triplekonzert); eine Violinsonate, die dem Gönner Beethovens, Erzherzog Rudolf, gewidmet war, und eine ‘Sonata quasi una fantasia’ für Klavier in b-Moll (auf Beethoven zurückblickend und auf Chopin vorausschauend), deren zyklische Konstruktion sie auf gleiche Ebene mit Schuberts ‘Wanderer’-Fantasie aus derselben Zeit bringt. Außerdem eine ganze Reihe Kirchenmusik, streng und katholisch, sowie achzehn Rhapsodien und Impromptus für Klavier aus den Jahren 1812/13 und 1822 – Explorationen in die frühe Romantik, die eine Überbrückung zwischen Tomásek und seinen Landsgenossen und des zukünftigen Folklorismus von Smetana und Dvorák lieferten. Unter den letzten Klavierkompositionen von Franz Joseph Haydn befinden sich die 1793 für Mozarts frühere Schülerin, Barbara von Ployer, geschriebenen Variationen in f-Moll (ebenfalls als Sonata un piccolo Divertimento bekannt). 1799 durch Artaria & Co (als Op 83) veröffentlicht und der Gräfin Josefine von Braun gewidmet, war der Anlaß ihrer Schöpfung, wie Robbins Landon (1955) nahelegte, wahrscheinlich der Tod von Marianna von Genzinger, der verständnisvollsten und vertrautesten von Haydns Wiener Freunden (sie war die Frau von Prinz Esterházys Arzt). Das Originalmanuskript (New York Public Library), meint Robbins Landon, legt ein ‘stilles und tragisches Zeugnis’ zu ihrem Heimgang ab: ‘Ursprünglich endete das Werk mit der letzten Variation; auf einigen losen Blättern … fügte Haydn dann die Koda hinzu, und es gibt keine andere Erklärung für den verzweifelten, leidenschaftlichen Aufschrei dieses nachträglichen Gedankens, diesen wilden Schmerz, der aus ihm herausströmt, unerwartet und unvorbereitet’. Ein Essay von konzentrierter Kraft und emotionaler Tiefe, das in einem Kapitel hohen Psychodramas gipfelt, ist die Musik, nach dem Vorbild von Emanuel Bach, in der Form einer doppelten Variationsstruktur gegossen – d.h. zwei zweiteilige Themen (das erste ein trübseeliges Andante in Moll, das zweite eine nachdenkliche Tröstung in der Dur-Tonika) werden abwechselnd als Grundlage für eine erweiterte Beschreibung und Entwicklung verwendet. Was die Harmonie anbetrifft, ist der Akkord im neapolitanischen Ges-Dur in der zweiten Hälfte des ersten Themas, die kommenden Dinge der mitleren Periode Beethovens voraussagend (nicht zuletzt die Appassionata und das Quartett Op 95) ein Markstein von besonders aufschlußreicher Intensität. Der Eröffnungssatz besteht aus fünf Teilen, die abwechselnd aus Agitato- und Andante-Material bestehen, wobei jede Tonartpräsentation der hauptsächlichen Andante-Idee strukturell und dynamisch unterschiedlich ist. Die abschließende, unharmonisierte Erscheinung dieses gemessenen Themas, die sich aus dem Schatten der Picardischen Terz vereinigt, ist verblüffend. Ein Schubertsches Scherzo in A-Dur im Zweivierteltakt mit einem Vierachteltakt-‘Trio’in der Subdominanten D umfaßt den zweiten Satz. Sein guter Humor läßt uns unvorbereitet für den dramatischen Kontrast des Finales, eine Studie in Sonatenform, die vollendete Klavierkunst verlangt, um den Stürmen und Belastungen ihres Auf- und Ab-Rennens gerecht zu werden. Alle drei Sätze sind zyklisch mit derselben deszendierenden Dreiklangfigur – die Mendelssohn jedoch kunstgerecht durch harmonische Veränderung oder dekorative Ausschmückung verschleiert. Wenn Paganini perfekt ist, so ist Kalkbrenner sein Gleichgestellter, aber in einer völlig anderen Stilart. Es ist schwer, Ihnen seine ruhige, seine bezaubernde Eigenart, seine unvergleichliche Ebenheit und das Können zu beschreiben, die in jeder Note dargestellt sind; er ist ein Riese, der über Herz und Czerny und alle – und über mich – hinwegsteigt … Sie müssen wissen, daß Kalkbrenner als Person hier so sehr gehaßt ist, wie sein Talent von jedermann respektiert wird. Er befreundet sich nicht mit jedem Narren, und … er überragt alles, was ich bis jetzt gehört habe. Aus historischer Sicht war Ludwig Beethovens An die ferne Geliebte (Op 98, 1815/16) das erste Beispiel eines vereinten, musikalisch kontinuierlichen Liederkreises. ‘Ein Lieblings-quellenwerk’ Schumanns, auf das er in bemerkenswerter Weise in seiner Fantasie, Op 17, anspielt, wurde der Liederkreis überall von frühen Kritikern bewundert: ‘Eines der schönsten aller Lieder, die wir besitzen … wenn er es erwünscht … kann er [Beethoven] Vokalmusik so gut wie jeder andere schreiben’ (Allgemeine Musikalische Zeitung, 1817). Aspekte der Sonatenkonstruktion, Variation und Strophenform verbindend, sind die sechs Lieder ‘in einer zweckvollen Reihenfolge von Tonarten arrangiert und weisen eine Reprise auf, der eine ‘symphonische’ Miniaturkoda folgt’ (Joseph Kerman, 1980). Die textierte und im wesentlichen dem Original treue Transkription von Liszt stammt aus dem Jahre 1849, in dem gleichzeitig Chopin starb. Alban Bergs Sonate in h-Moll (Wien 1907/08) gehört zu seinen Studienjahren bei Schoenberg. Ein dunkles Werk von durchdringender Tragik, einen leidenschaftlichen, an Tristan anlehnenden Schatten werfend, Mahlers spätromantische Vorstellungen aufweisend, die tonale Zweideutigkeit seiner Dreiklänge und Tritonus … die Suspension und Auflösung seiner Harmonie … die Komplexität seines Rhythmus … die konzentrierte Art seines motivischen Wachstums … die Resignation, die sich bis zum Höhepunkt steigernde Anschwellung, das gespannte Drama seines spirituellen Schreis … die Art, wie es einen Blick des kommenden Denkers erhascht, den visionären Schöpfer von Wozzeck und Lulu … kennzeichnen das Werk als eines der beachtlichsten frühen Dokumente des 20. Jahrhunderts. Indem sie von der ‘subjektiv gesehen ‘emotional’ heilen Welt’ des Werkes spricht und von seinem ‘einizigartigen sparsamen Einsatz der Mittel’, seiner uneingeschränkten Romantik und dennoch ‘erstaunlichen Zurückhaltung’, identifiziert Susan Bradshaw (1972) sein essentielles Paradoxon. Es stellt eine außergewöhnlich starke Aussage dar – in geistiger Hinsicht nackt, formell unter Kontrolle gehalten – und entfaltet sein fortlaufend evolvierendes und sich entwickelndes Geschehen in neun Seiten kompliziert­ester, kontrapunktischer Ausdrucksform, intimer, kammermusikartiger Empfindlichkeit und gewaltig strukturiertem pianistischen Höhepunkt. Der allgemeine Grundplan spielt nahtlos auf einen einsätzigen Sonatenentwurf an mit (wiederholter) Exposition, Ausschmückung (Leibowitz’ Terminus) und Reprise mit eingefügten Fragmenten, die ein Scherzo und Adagio andeuten. Von keimender Bedeutung für alles was folgt, ist die Eröffnung aus einer piano/accell/rit Geste geformt, die aus drei Grundzellen besteht: (a) aufsteigende reine und zunehmende Quarten (von Schoenbergs Erster Kammersinfonie von 1906 geborgt und thematisch und harmonisch verwendet); (b) abfallende große Terzen (die einen zunehmenden Akkord verdeutlichen); und (c) eine fallende Halbtonsuspension. Allgemein als eine der bedeutendsten schöpferischen Kräfte der Generation nach Prokofjew/Schostakowitsch betrachtet, die gegenwärtig in Rußland arbeitet, studierte die tatarische Komponistin Sofia Gubaidulina Klavier und Komposition in Kazan. Anschließend, zwischen 1954 und 1963, besuchte sie das Moskauer Konservatorium, wo ihre Lehrer u.a. Schebalin und Peiko waren. Eine rebellische Studentin, die sich zum Unorthodoxen hingezogen fühlte, erlebte sie in ihrer Jugend sowohl Schostakowitschs Zustimmung als auch seine Mißbilligung: ‘Ich möchte, daß Sie auf Ihrem irrigen Weg weitergehen,’ soll er ihr einmal geraten haben. Gubaidulina, die einen starken religiösen Glauben und mystische Überzeugungskraft besitzt und eine Anhängerin des Philosophen Nikolai Berdjaew ist, lebt in Moskau, wo sie ihre Zeit zwischen Komponieren, Schreiben von Musik für Dokumentarfilme, Filme und Zeichentrickfilme und Experimenten mit ungewöhnlichen Klängen und Materialien aufteilt. (Seit 1968 ist sie mit dem Elektronischen Musikstudio in Moskau verbunden und bildete 1975 eine Gruppe namens Astreja, die sich auf die Improvisation mit Volksinstrumenten aus den transkaukasischen und zentralasiatischen Republiken spezialisiert.) Gubaidulina, die 1980 von der Union Sowjetischer Komponisten denunziert wurde, weil sie einen avantgardistischen Stil kultivierte, der sich zu sehr mit ‘der Lösung von Problemen sekundärer Bedeutung … außerhalb des wirklichen Lebens’ beschäftigte, gewann jedoch 1975 den Siebenten Internationalen Komponistenwettbewerb und erhielt 10 Jahre später den Kompositionspreis der Prince Rainer von Monaco Stiftung. Bach, Webern und Schostakowitsch, sagt sie, waren ihre hauptsächlichen Einflüsse bei ihrer musikalischen Entwicklung. Zu einem größeren oder kleineren Ausmaß haben alle drei für die 1962 geschriebene Ciacona für Klavier Bürge gestanden. Hierbei handelt es sich um eine außergewöhnliche Tour de force. Einerseits ist das Werk chromatisch- diatonisch tonal: es beginnt und endet in h-Moll. Andererseits ist es frei seriell: sein Grundbaß, der am Ende oktavenmäßig verdeutlicht ist und am Anfang horizontal und vertikal verkündet wird, macht insgesamt eine Tonreihe von 23 Noten aus, indem alle zwölf Tonhöhen der chromatischen Tonleiter verwendet (und unterschiedlich wiederholt) und aus angrenzenden und übereinstimmenden Moll- und Dur-Terzen gestaltet werden, die von Segmenten zweier Volltonsteigungen abgerundet werden. Diese Tonreihe unterliegt Prozessen der Inversion, umgekehrter Bewegung und umgekehrter Inversion. Durch ihr Transponieren auf verschiedene Grade der Tonleiter, wird eine Illusion von sich verändernden ‘Tonart’-Zentren und ‘Modulation’ geschaffen. Im Geiste Bachs, kein Geringerer als Brahms (das Finale der Vierten Sinfonie) ist Gubaidulinas Ciacona in ihrer Essenz sowohl eine Chaconne (eine wiederkehrende harmonische Sequenz) als auch eine Passacaglia (ein wiederkehrender Grundbaß). Strukturell gesehen, als ein Variationszyklus, ist sie rotierend. Gleichzeitig, gemäß der großen Meister, wird ihr Umriß durch subtiles Abweichen von höchst erfinderischer Flexibilität durchdrungen. Sie mag zum Beispiel pseudobarokartig mit einer grandiosen Aussage, andante maestoso, acht Takte lang, eröffnen. Aber im Interesse musikalisch-dramatischer Notwendigkeit sind nur wenige ihrer 23 nachfolgenden Teile (so viele Teile wie Noten in der Tonreihe) – dabei jeder Teil hörbar unterschiedlich durch Änderung der Struktur, des Tempos, des rhythmischem Musters, des dynamischen Spiegels und der Tastenkonfiguration – auf diese Länge begrenzt. Die meisten sind entweder expandiert oder verkürzt. Das siebente der zehn Stücke, die Franz Liszts Harmonies poétiques et religieuses, Funérailles bilden, erprobt das Monumentale und das Tragische. Ein außergewöhnliches, ausgedehntes in memoriam von epischer Vision und elegischem Gesang, von Qualen und Tränen zerrissen, gedenken seine Seiten nicht dem Tod Chopins (eine ehemalig vorwiegende Ansicht, die auf der Assoziation der rotierenden linken Oktaven seines vierten Teils mit denjenigen des Terzetts in Chopins Polonaise in As-Dur, Op 53, basiert), sondern dem gescheiterten ungarischen Aufstand vom Oktober 1849. Bei seiner Entfaltung finden wir ‘nicht nur den Ausdruck einer persönlichen Trauer,’ glaubt Alan Walker (1989), ‘sondern ein Symbol dieses universellen Leidens, das die Menschheit empfindet, wenn große Ideale sterben und die Helden, die für sie eintraten (egal welcher Nationalität) nicht mehr sind’. Franz Schuberts Impromptus D899 (seine erste Serie) wurden während der zweiten Hälfte des Jahres 1827 vervollständigt. Ihre Veröffentlichung fand über eine Zeitspanne von 30 Jahren statt, d.h. 1827 (Nr. 1 und 2) und 1857 (Nr. 3 [um einen Halbton aufwärts transponiert] und Nr. 4). Im Originalmanuskript (heute in New York) sind weder der Titel noch der Name in Schuberts eigener Handschrift. Wie ihre Gegenstücke D935 und D946, stellen sie Aussagen dar, die sich in Freiheit des lyrischen Geistes der Romantik auf die 42 Eklogen, 15 Rhapsodien, 3 ,i>Dithyramben und 6 Allegri von Tomásek beziehen (Musik, die sich über einen Zeitraum von 1807 bis 1823 erstreckt) sowie, in breiter Struktur, auf die Impromptus, Op 7, von Worzischek (1822 in Wien gedruckt) – wobei beide zufälligerweise böhmische Komponisten aus Prag sind. Nichtsdestoweniger sind sie innovative, forschende Kreationen, die, wie Alfred Einstein uns erinnert, gleichzeitig von einer unverkennbaren Schubertschen Originalität, von Dimensionen organischen Wachstums und wunderbar vereinter und variierter Farbe durchdrungen sind. Nr. 4, das in seiner ternären Form nach außen hin am meisten Worzischek entspricht, kontrastiert Etüdenbrillianz mit einer Tenormelodie singender ‘Cello’-Eloquenz und einem pulsierend elegischen, mittleren Terzetteil in cis-Moll. Die Besetzung seiner ersten Seite, reich an herabfallenden gebrochenen Akkorden und wiederholten Noten in Phrasen von sechs (4+2) Takten, ist bemerkenswert insofern, als daß der Grundton der Grundtonart (Takt 31) erst nach dem Beginn in Moll eingeführt wird, dem zwei ausweichende Ableitungen in Richtung H- (= Ces) Dur bzw. Moll folgen.